Two fired destroyer leaders who were found guilty at mast for dereliction of duty A former executive officer and 33-year officer convicted at mast for dereliction of duty in the wake of a suicide on board his ship is fighting for his career have legal grounds to get their career-ending discipline lifted, legal experts now say. but new questions have emerged that racast doubts on the Navy's handing of his case and raise the prospect of undue command influence. Cmdr. Ed Handley, the former executive officer of the destroyer James E. Williams, was taken to mast and issued a punitive letter of reprimand, along with his commanding officer Cmdr. Curtis Calloway. The mast was carried out by their Destroyer Squadron commodore after his boss, Rear Adm. Andrew Lewis, the strike group commander, recommendeddirected they be taken to mast — raising the specter of undue command influence over the DESRON's handling of the case. and Command Master Chief Travis Biswell, after an investigation into the ship's command climate claimed command leadership had let the chiefs mess run out of control. It is considered undue command influence for a senior officer to direct or recommend his subordinate impose nonjudicial punishment, a move that trods upon the subordinate's independent discretion. "This smacks of unlawful command influence," said David Sheldon, a former Navy judge advocate general Washington defense attorney and one of the four military law experts who reviewed the case for Navy Times. "It is patently wrong, but sadly very typical of Navy brass trying to influence the outcome of a case. Admiral Lewis passed the buck, instead of taking the responsibility his command had over subordinates as was his responsibility. Bottom line — if Admiral Lewis felt the case deserved mast punishment, he should have put his big boy pants on and conducted the mast." 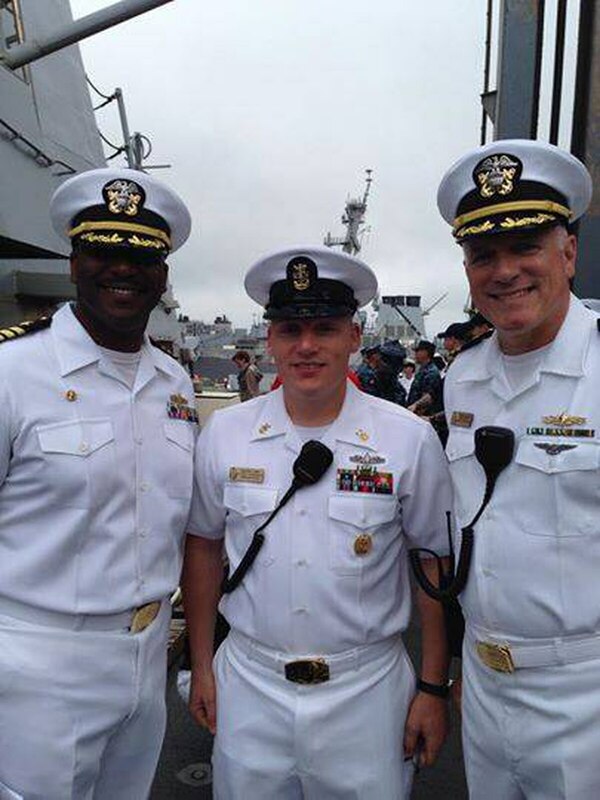 The Navy rarely punishes an entire command triad; Command Master Chief Travis Biswell was also reprimanded at mast. case made headlines because punishing and removing an entire command triad is rare. Handley's fight to clear his name and save his 33-year career was the Navy Times' cover storyfor Navy Times in its Feb. 23 issue. Observers and legal experts who spoke to Navy Times are now calling into question the handling of the investigation and subsequent non-judicial punishment actions, saying the proceedings were tainted by the suggestion of a predetermined outcome. One attorney and former Navy JAG said the process "smacks of unlawful command influence." The issue stems from the questions begin with the endorsements and steady ratcheting up of the consequences as three rungs of senior officers reviewed the report and wrote endorsing letters that recommended disciplinary steps. on each report endorsement, starting with the investigator Capt. Tony Simmons, and finishing with Rear Adm. Peter Gumataotao, head of Naval Surface Force Atlantic, closed the report. The investigator, Capt. Tony Simmons, and the first endorsement letter, signed by the James E. Williams' immediate superior Capt. Fred Pyle, head of Destroyer Squadron 2 commodore, recommended that Handley be administratively reassigned and issued a letter of instruction. Pyle also called for and, in Pyle's case, that Handley to be stripped of his command screening. Calloway was recommended for a relatively light administrative punishments — an administrative cautioning on his way out the door as CO, a recommendation that was not modified by Pyle in his endorsement. But when the investigation reached the desk of Rear Adm. Andrew Lewis, the head of Carrier Strike Group 12 boss, he stated that Calloway was either willfully blind or in a state of denial about the failure of his command climate, and that he should be taken to mast. Similarly, Lewis recommended that Handley be taken to mast for the failure of the equal opportunity program, and seconded Pyle's recommendation that he be stripped of command. Gumataotao signed off on the recommendations. The investigation was triggered by the June 2014 suicide of concluded a "culture of retribution" had tin the chief's mess, the report claimed, was a contributing factor in the suicide of Boatswain's Mate Seaman Yeshabel Villot-Carrasco. The report asserted that a "culture of retribution" among chiefs had been a contributing factor. had taken hold in the chief's mess. Handley was in part blamed for failing to address an incident of alleged alcohol abuse by related incident involving the CMC, the report said, and for the equal opportunity program that failed Villot-Carrasco. Gumataotao essentially rubber stamped the investigation, stating "I concur with the findings of fact, opinions, and recommendations of the investigating officer, as modified by [Lewis]." This is where the leaders involved begin to overreach their authority, legal experts say, because In an Oct. 10 press release, Fleet Forces Command announced that "Capt. Fred Pyle, Commander, Destroyer Squadron 2, awarded separate non-judicial punishments (NJP) to" Calloway, Handley and Biswell. hat's a problem because Pyle's, in his official endorsement, dated Sept. 21, never said anything about non-judicial punishment for Calloway and Handley and the mast came weeks after after Lewis' Sept. 26 endorsement letter. He had recommended only administrative punishments for them, but wound up finding them guilty at mast and issuing them punitive letters of reprimand that will effectively end their careers. Pyle said the decision to take the officers to mast was his alone. "Based on the findings of the investigation, I determined CDR Handley needed to be held accountable, and I indicated as much in my endorsement when I firmly expressed that he was not fit for command at sea and that I did not have confidence in his ability to foster a healthy command climate," Pyle said in a Feb. 20 statement. "All of that was consistent with the willful blindness of both the CO and CDR Handley to the failures on board the ship, which I found to be significant contributing factors to my decision to hold them accountable at NJP." Calloway and Handley but, in the final reckoning, he handed the former CO and XO of James E Williams each a punitive letter of reprimand, which is a permanent black mark on a Navy career. The fact that Lewis recommended the mast, backed by his immediate superior Gumataotao, but did not conduct the mast himself raises the appearance of unlawful command influence. According to the Manual for Courts Martial, the governing instruction for Article 15 punishments, as well as the Navy's own JAG instruction make clear that superiors cannot direct a subordinate to impose mast, and legal experts agree. Still, the legal experts cautioned that Lewis' statement well before the mast tainted this process. "The Manual for Courts Martial makes clear that Rear Adm. Lewis cannot direct Capt. Pyle to impose NJP because every commander must retain his or her independent discretion," said Timothy Parlatore, a former surface warfare officer and Manhattan defense attorney who does extensive pro-bono work for sailors facing the military justice system. "Rear Adm. Lewis had the option of imposing NJP himself, but declined to do so. By causing Capt. Pyle to implement NJP, Rear Adm. Lewis placed himself in the position of deciding Cmdr. Handley's eventual appeal, rather than allowing his own superiors to review his decisions." And that's a conflict, Parlatore said in an email. Even though if Pyle says claimed that he wasn't influenced by his boss' Lewis's recommendation, Parlatore says this has already tainted the case and notes that case law has and Gumataotao's ultimate endorsement of Lewis's recommendations, it wouldn't hold water because prior case law has "specifically rejected the notion that a subordinate can exercise independent judgment when their superior suggests that they reconsider, especially where the subordinate commander was already aware of the full scope of the allegations." "Cmdr. Handley's appeal from the NJP appears to have been hopelessly infected by Rear Adm. Lewis' pre-judgment and unlawful command influence," Parlatore said. One former Navy JAG put it more bluntly. "This smacks of unlawful command influence," said David Sheldon, a Washington defense attorney and military law expert. "It is patently wrong, but sadly very typical of Navy brass trying to influence the outcome of a case. Admiral Lewis passed the buck, instead of taking the responsibility his command had over subordinates as was his responsibility. Bottom line--if Admiral Lewis felt the case deserved mast punishment, he should have put his big boy pants on and conducted the mast." Three other attorney's with JAG experience weighed in for this article, and all agreed that the actions by Strike Group 12, and backed by Gumataotao, appear to be a clear-cut case of added up to unlawful command influence. "There are two types of unlawful command influence, there is apparent and then there is actual," said Ken Lee, a former Marine lieutenant colonel in the Judge Advocate Corps, in a Feb. 19 phone call. "This is a situation where it's apparent." Lee, who is now a reservist and lawyer for the firm Tully Rinckey, which specializes in military law, said the fact that Lewis recommended the mast and passed it back to Pyle to conduct made it look like there was an outcome in mind before the case went to trial because it set up Lewis as the ultimate appeal authority. "So if Rear. Adm. Lewis, had administered it, [it] would have removed the appeal from anyone who was intimately involved in the details of this case to begin with, and that's what you want. It looks like they are trying to keep this within themselves." The legal experts said Lawyers who weighed in on this said Handley and Calloway have some options to fight the outcome, but it isn't easy. Parlatore said the options for Handley include attempting to elevate the case to the next step in the chain, which would likely be Fleet Forces Command, since Gumataotao has already weighed in; filing a complaint with his congressman, who is Rep. Peter King (R-N.Y.) ; or appealing attempting to have Navy Secretary of the Navy Ray Mabus for a case review the case. He can also sue in federal court, though courts have been reluctant to weigh in on military personnel matters in the past. "I would hope and expect that CDR Handley will continue to pursue all possible avenues for review, both administrative and judicial, as the federal court does have the limited ability to review captain's mast proceedings to determine if all the proper rules and procedures have been followed," Parlatore wrote. The Board for Correction of Naval Records, an independent liaison to Navy Personnel Command, can also remove the NJP from Handley and Calloway's records if they concludeon the basis that the NJP was improperly adjudicated. Sheldon, the former Navy JAG, said Handley and Calloway would have a fighting chance at BCNR to get "a very good result." Handley said in a Feb. 6 statement to Navy Times that he welcomed the chance to clear his name, and that he and Calloway are awaiting a determination from NPCPersonnel Command on whether or not they will be required to prove to a board why they should be retained in the service.should show cause for retention in the Navy. "I want a board of inquiry in any case to clear my name and then a BCNR to purge my record," he said.